Ben 10: Omniverse was a Wii U launch title and it appears to have done well enough as a sequel will be coming later this year, courtesy of D3Publsiher and Cartoon Network. The original was also on Wii and 3DS and both these platforms are being supported again. Appropriately titled Ben 10: Omniverse 2, this adventure game sees you embark on a new quest with young Ben and his Omnitrix-powered alien forms. It looks as though the galaxy is under threat once again, with the Incurseans, led by their Emperor Mileous, looking to take over. As Hollywood movies have taught us, armies are completely useless in these situations, but thankfully Ben and his partner Azmuth are around to fend off this new intergalactic baddie. This edition features some new challenges such as chase and escape sequences and an open-ended combo-based combat system, which sounds interesting. The home console versions of the game allow you to fight with ten alien forms, while there are 17 on the 3DS. Characters include Big Chill, Bullfrag, Rath, and Eatle, with each of them having their own role in combat and platforming. Ben 10: Omniverse 2 is scheduled to be released in the Fall of this year. It featured at this year's San Diego Comic-Con where a lovely new trailer emerged - you can see it below. The original title was also available on the DS, however this time around it's not being supported, which may be disappointing for some. 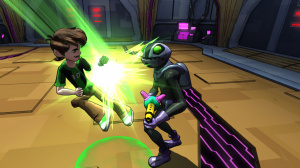 You can see what we thought to the Wii U version in our Ben 10: Omniverse review. Are you looking forward to this one? Let us know by leaving a comment. Man I hate Ben 10 after the first series. I feel that Omniverse is quite underrated. It's certainly isn't worse than the first series, and not to mention it is a Saturday morning cartoon. I liked the first game, but come on, another game of this! pfff... please skip these games, and work on real games. welcome to the next generation that is the Wii U ..
And yet another game for children. Kids game console the Nintendo Wii-U!!!! Love the cartoons. Hope this game is better than the first. The original Ben 10 series is still the best. I loved playing Ben 10 Titles on my DS and Wii from 2006. I even played Ben 10 Galactic Racing on my 3DS, I still do sometimes and it's like a mixture of F-Zero and Mario Kart, only with Ben 10 Characters and crappy steering. However, I stopped at Ben 10 Omniverse.